Choloy-Ménillot is a village 28 kilometres west of Nancy and 5 kilometres west of Toul, a town on the N4 road from Paris to Nancy. 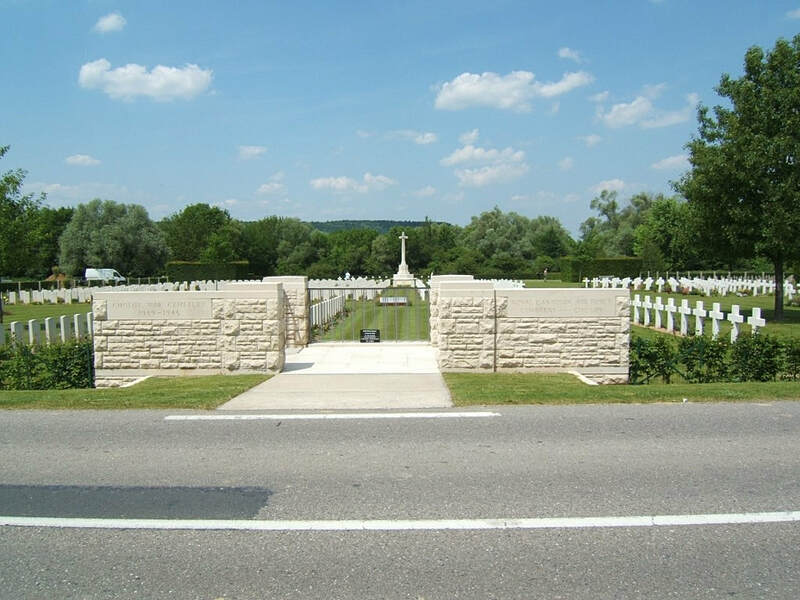 The War Cemetery is 3 kilometres west of Toul on the north side of the D11B road. 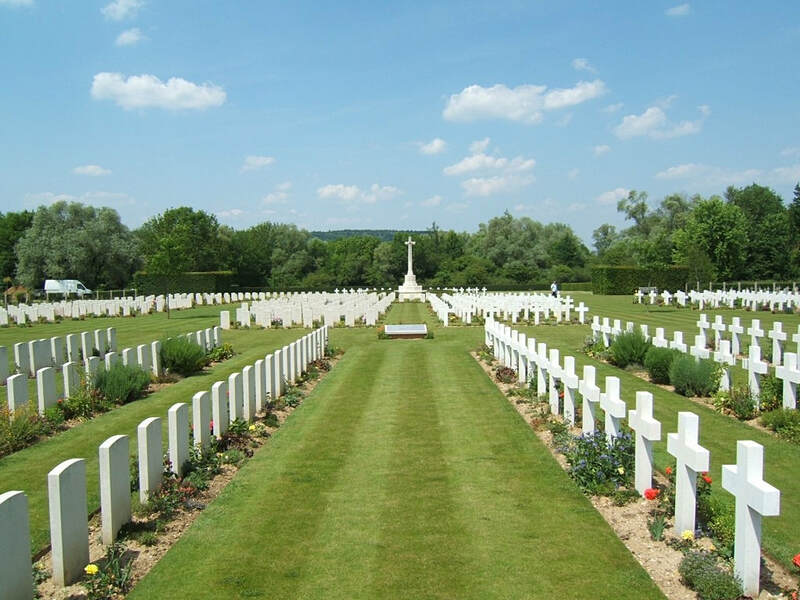 Choloy War Cemetery was created by the Army Graves Service for the re-burial of casualties recovered from isolated sites, communal cemeteries, and small churchyards in north-eastern France where permanent maintenance of the graves was not possible. In 1950, for the same reason the Commonwealth War Graves Commission found it necessary to move in to this cemetery more than 100 graves from a number of churchyards and civil cemeteries in the same area. Those who lie in Choloy War Cemetery are mostly airmen; but there are also soldiers belonging to the forces of the United Kingdom who died in the Saar region during the first few months of the war, i.e. up to May 1940, or as prisoners of war. 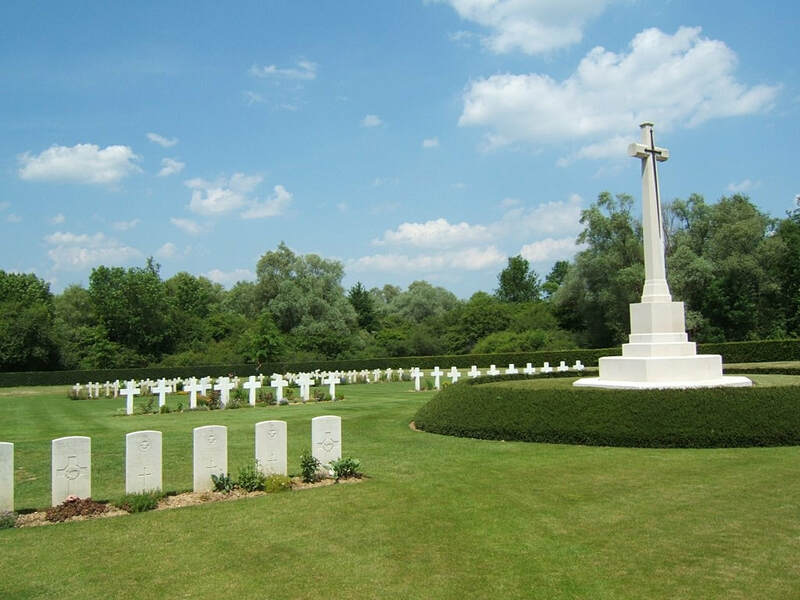 There is now 1 Commonwealth burial of the 1914-1918 war and 461 of the 1939-45 war commemorated in this site. Of these, 20 of the 1939-1945 burials are unidentified. In addition there are 7 Foreign National burials, 2 of which are unidentified and 334 non world war burials here. 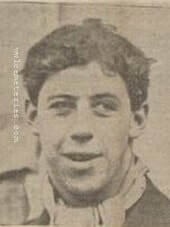 Leslie Redford Clisby, D. F. C.
14th May 1940, aged 25. INSCRIPTION. GLORIOUS IN LIFE GLORIOUS IN DEATH. Son of Albert E. Clisby and Mabel E. Clisby, of North Walkerville, South Australia. 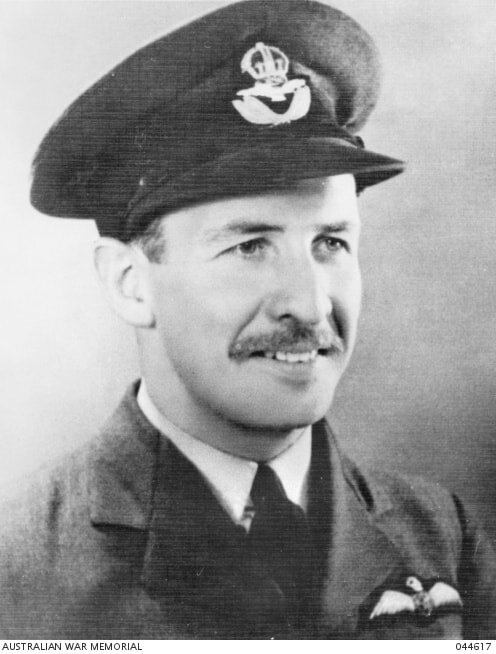 FLYING OFFICER LESLIE REDFORD CLISBY, DFC, ROYAL AIR FORCE BORN MCLAREN VALE, SA 1914-06-29. 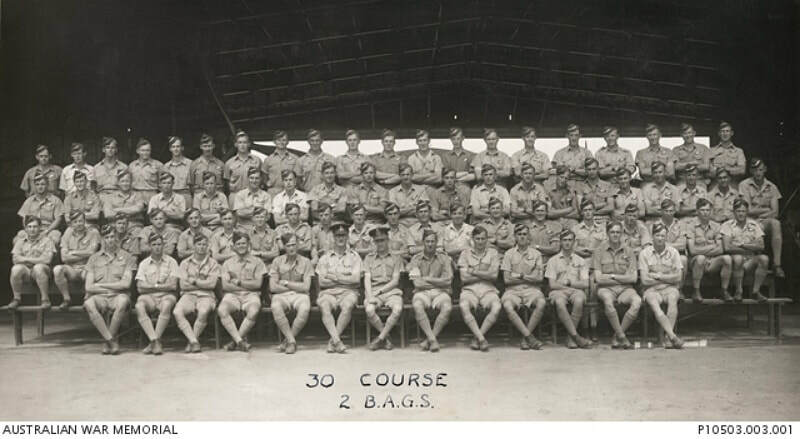 TRAINED RAAF POINT COOK, VIC 1935-1937. 1937-07 SHORT TERM COMMISSION TO RAF AS PILOT OFFICER. 1937-12 APPOINTED AS FLYING OFFICER TO NO. 1 FIGHTER SQUADRON, TANGMERE- SUSSEX, ENGLAND. 1939-12-03 WENT TO FRANCE WITH NO. 1 FIGHTER SQUADRON IN ADVANCED AIR STRIKING FORCE. MISSING FRANCE 1940-05-15.- AGE 25 YEARS 11 MONTHS. 124.11 (LENT BY R.A. ECKERT). 13th August 1944, aged 22. Son of Henry and Florance Wilson Etherton, of Kogarah, New South Wales, Australia. 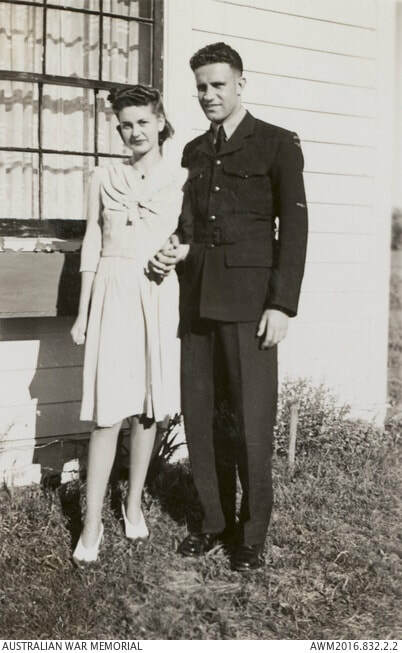 Outdoor portrait of 423088 of Sergeant Ronald Henry Etherton RAAF with his sweetheart Jean Ayre. They met while he was stationed in Canada with the Empire Air Training Scheme (EATS). Outdoor portraits of 423088 of Sergeant Ronald Henry Etherton RAAF during his aircrew training. He enlisted on 20 June 1942 and spent two years training in Australia and Canada before being posted to No. 76 Squadron, RAF in June 1944. Flight Sergeant Etherton was lost on operations over France on 13 August 1944. He was on a mission heading for Russelsheim near Frankfurt, Germany. 7th June 1940, aged 21. Son of Reginald G. Kain, and of Nellie Kain, of Wadestown, Wellington, New Zealand. ​Group portrait of participants of the No 2 Bombing and Gunnery School (BAGS), Course 30, on graduation day. Leading Aircraftman (LAC) Reader; LAC O'Sullivan; LAC Ziersch probably 417690 Flight Sergeant (Flt Sgt) Leslie Ernest Ziersch (lost on operations over the United Kingdom on 11 April 1944); 417830 LAC Geoffrey O'Halloran Giles; 417820 LAC Frederick Dyer; LAC Ballinger; LAC Sincock; LAC Parham; LAC Johnson; LAC Quinlivan; LAC Willington; LAC Banfield; LAC Payne; LAC Kirkham; LAC Bonham; LAC Kerfoot; 419298 LAC (later Flying Officer [FO]) Harry Ronald Crout (lost on operations over France on 10 May 1944); LAC Phillips; LAC Porter; LAC Wallace. Third row: 427438 Flt Sgt Gergo Caveridge (lost on operations over Germany on 28 September 1944); Clark; Dutton; 427502 LAC (later Flt Sgt) Paulus Senor Coronel (killed in an accident in the United Kingdom on 25 September 1944); Lamberton; 417821 LAC (later Warrant Officer) Harold Murray Earle (lost on operations over the North Sea on 29 October 1944); LAC Groves; LAC Randell; LAC Scott; LAC Morton; LAC Potter; LAC Walters; LAC Oliver; LAC Bunce; LAC Mitchell; LAC Kiddle; 26221 LAC Alick Betram Ewens; possibly 417818 LAC (later Flight Lieutenant [Flt Lt]) Clifford Harris Drewer (lost on operations over France on 24 June 1944); LAC Horinack; 410144 LAC (later Flt Sgt) Ronald Charles Brookman (lost on operations over France on 26 September 1944). Second row: LAC Brand; LAC Moffitt; LAC Seymour; LAC Lowe; LAC Lake; LAC Mander; LAC Murray; possibly 417855 LAC (later Flt Sgt) Rex Tidswell Lathlean (lost on operations over the United Kingdom on 24 July 1944); LAC Baynes; LAC Keightley; 419332 LAC (later Pilot Officer) John Barrie Nanscawen (lost on operations over Germany on 8 February 1945); 417826 LAC (later Flt Sgt) Frank Edgar Fischer (lost on operations over Germany on 29 July 1944); 410536 LAC (later Flt Sgt) Leonard Allan Eunson (lost on operatipons over France on 6 August 1944); King; 419387 LAC (later Flt Sgt) Gregory Herbert Hunkin (lost on operations over N. W. Europe on 27 June 1944); LAC Adams; LAC Kitto; LAC McRostie; LAC Martin; possibly 418744 LAC Conrad Fontaine. Front row: 417822 LAC David Easterbrook; LAC Bury; LAC Andrews; Corporal (Cpl) Kiddle; Sergeant (Sgt) Barnes; Warrant Officer (WO) Hunt; Flight Officer (FO) Allmand; Flight Sergeant (FS) Wilson; Sgt Stanbury; 417824 LAC (later Flt Sgt) Albert Wilson Farrer (lost on operations over France on 16 August 1944); LAC Hughes; LAC Carlton; LAC Ashurst. ​Lethbridge, Alberta, Canada. Empire Air Training Scheme - group portrait of air crew trainees. Top row: 424525 Francis Clyde Lamond (Frank) Hurley; "Dotty" Lamour; Arthur Adlam; Harold Costley; 428642 George Caleb Groves (later of 463 Squadron and lost on operations on 4 December 1944); 408471 Warren White; 428930 John Ernest "Penny" Penman; 428080 Geoffrey Allan (Geoff) Trollope; Ian Petrie; Sam Nelson; Johnny Normoyle; 437046 Eric Chenoweth (later 635 Squadron RAF and lost on operations 31 March 1945); Tommy Corlett; Ian Rae; Les Gibbs; Bill Smith; 430141 Bruce Maxfield; Alec Christie. Centre row: "Bluey" Moore; "Shag" Wilson; Jimmy Matheson; Pilot Officer (PO) Shanks; Warrant Officer II Woods; Taffy Evans; Ivan Vanovitch; PO Mitchell; Ken Rees; Ray Harvey. Front row: Keav O’Leary; 427854 Roy Leslie Crossman; Gus Winstanley; George Witby; Ian Rowe; Ron Noice; "Pip" Pribble; Bill Taylor; 428139 Merv Limbrick; 429012 Geoffrey David (Geoff) Hatfield; 429529 Lionel Dittmann; 429115 Brian Keating; Eric Ray; Frank Hollins; Les Boulton; Frank Gilbert.